Valsartan & Cancer | Does NDMA in Valsartan Cause Cancer? How Much NDMA Is in Valsartan? The U.S. Food and Drug Administration recalled some batches of valsartan contaminated with the cancer-causing agent N-nitrosodimethylamine (NDMA). The agency estimates that 1 in 8,000 people who took contaminated valsartan may suffer from one case of valsartan NDMA cancer in a lifetime. NDMA causes tumors, internal bleeding and death in animals and may cause cancer in humans. Cancer may occur in people who took batches of valsartan contaminated with N-nitrosodimethylamine (NDMA), a toxic chemical that may cause cancer. Studies compiled in a report published by the World Health Organization showed that NDMA caused tumors and death in animals. The report noted that the International Agency for Research on Cancer (IARC) had upgraded NDMA from “possibly carcinogenic to humans” to “probably carcinogenic to humans” based on conclusive evidence. A 2018 Danish study in the BMJ did not show an increase in the short-term risk of cancer in people who took the tainted valsartan. But it provides short-term reassurance only, experts say. About 3 million Americans take valsartan to treat high blood pressure or heart problems. The U.S. Food and Drug Administration announced a recall of half of the supply of valsartan in the U.S. because of NDMA contamination. Cancer is not one of the typical valsartan side effects, but people exposed to the contaminated drugs may develop cancer form NDMA exposure. In September 2018, the FDA, European Medicines Agency and Health Canada announced it found a second cancer-causing chemical in the same family as NDMA called N-nitrosodiethylamine (NDEA). Lawyers are filing valsartan lawsuits for people who suffered digestive tract cancers after taking valsartan. These include liver, stomach, colorectal, bladder and pancreatic cancer. N-nitrosodimethylamine, or NDMA, is a yellow, odorless liquid chemical once used to make rocket fuel. It is also a byproduct of several manufacturing processes and water chlorination. Small amounts of NDMA may occur in water, soil and air. Normally, it breaks down when sunlight hits it, according to the Agency for Toxic Substances & Disease Registry. In addition to contaminated valsartan, people may also consume NDMA through water and food. Drinking water has small amounts of the chemical, and some foods contain NDMA and other toxic chemicals in the same family, called nitrosamines or alkylamines, which can turn into NDMA in the stomach. Normally, these small amounts occur when the food or drink is processed. One pound of bacon may contain 0.304–0.354 micrograms of NDMA. The liver breaks down NDMA, which leaves the body through exhaled air or urine. The EPA set a threshold of 0.11 µg/L (micrograms per liter) of NDMA in tap water. The agency set this limit based on a lifetime risk of one additional person in one million people developing cancer at that level of NDMA. Each state has its own limits for NDMA in drinking water. Most are below the EPA’s acceptable limit. The average NDMA levels detected in contaminated valsartan were 60 parts per million (ppm). This is more than 1,000 times the amount most people consume in drinking water daily. The Agency for Toxic Substances & Disease Registry released a public health statement in 2015 claiming that animals who suffered liver disease, cancer and death had consumed water containing 5 to 50 ppm of NDMA and 5 to 100 ppm in food. Zhejiang Huahai, the Chinese valsartan manufacturer, believes the NDMA contamination occurred after it changed its manufacturing process in 2012. What is valsartan’s link to NDMA and cancer? 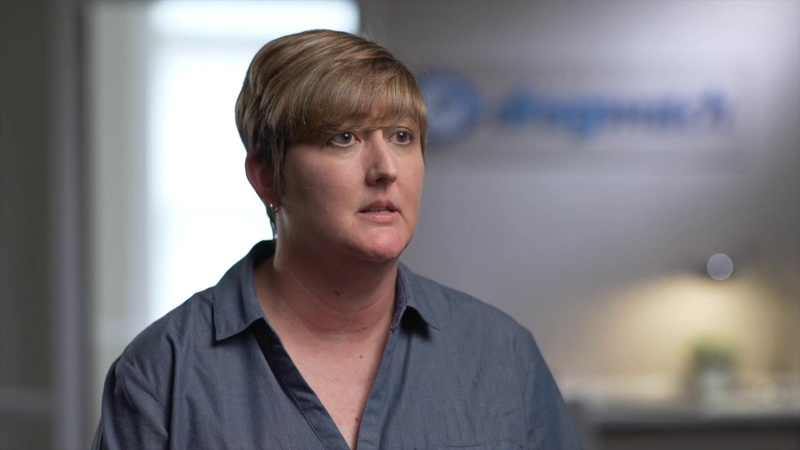 Registered Nurse Amy Keller explains valsartan's link to NDMA and cancer. The FDA estimated that there would be one extra case of cancer for every 8,000 patients treated with the highest dose (320 mg) of contaminated valsartan every day for four years. The European Medicines Agency offered a similar calculation of 1 in 5,000 for people treated with 320 mg daily for seven years. Danish researchers found contaminated valsartan slightly increased the risk for colorectal and uterine cancer. The 2018 Danish study found a low short-term risk of cancer. It followed 5,150 people with no history cancer who started taking valsartan between Jan. 1, 2012, and June 30, 2017. Researchers found 104 cancers in people not exposed to NDMA and 198 cancers in people exposed to tainted valsartan. But authors said researchers need more studies to determine long-term risk. 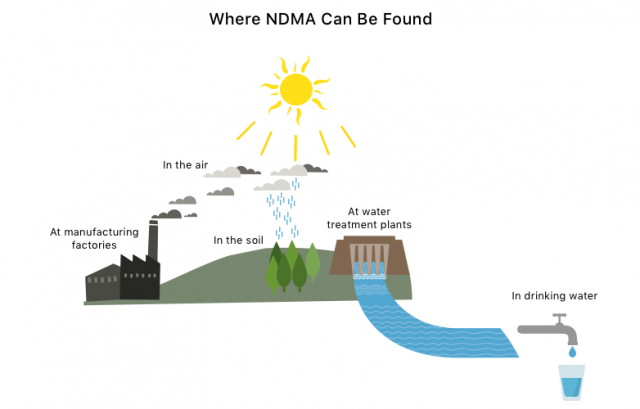 Exposure to NDMA can cause cancer in animals and in humans, but the EPA says there are no reports of cancer in humans. However, a study published in Occupational and Environmental Medicine found that rubber workers exposed to NDMA in factories had an increase in cancer of the esophagus, oral cavity and pharynx. In animals, NDMA caused tumors in the liver, respiratory tract, kidneys and blood vessels. Animals exposed to NDMA suffered liver damage and cancer often leading to internal bleeding and death. Treatment for each type of cancer depends on its location and how far it has spread. NDMA is toxic to humans, and overexposure can cause a number of symptoms. Water and food are the main ways people are exposed to the chemical. Researchers have not established toxic levels for blood, so overexposure is difficult to diagnose. But doctors can monitor liver function and blood glucose levels as well as check for internal bleeding. The levels of NDMA in valsartan pills are not likely to cause acute symptoms of overexposure. But treatment includes activated charcoal for ingested NDMA, oxygen for inhaled NDMA and saline washes for eyes.